The German eyewear manufactory Lunor has always been fascinated by metal frames. 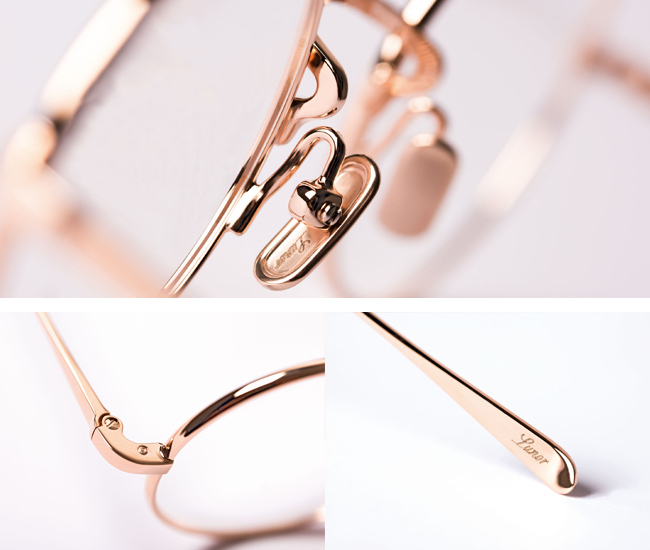 So, the brand name itself is derived from the French term “Lunettes d’Or” – in English: gold glasses. Already in the 19th century, metal frames characterised an entire era, and they are currently experiencing a real revival. Lunor’s new M9 Collection also wants to make history by featuring striking statements with a trendy metallic finish. The models of the new M9 Collection shine in three different nuances: gold, silver and rose gold give the fine titanium frames a unique brilliance. Every little detail is bathed in metal colours – from the unique Lunor titanium pad to the hinges and the sweeping lines of the temple’s end. Coming in three variations, the metal models are likely to be popular with many wearers: In a small and a large version, all-rounder Panto meets classic round and clean square shapes. But no matter which design finally adds metallic contours to the Lunor lover: the unique wearing comfort remains, thanks to ultralight titanium. In addition, the new M9 Collection unites German design and international craftsmanship. All of Lunor’s titanium models are handcrafted in an exclusive manufactory in Japan. The East Asian state’s special expertise with regard to titanium frames repeatedly confirms Lunor in this cooperation. Check out these few models from the new collection!